(CNN) -- Continental shelves beneath the retreating polar ice caps of the Arctic may hold almost double the amount of oil previously found in the region, scientists say. 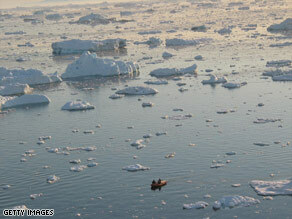 A new survey finds the Arctic could hold almost double the amount of oil previously found in the region. In new findings, the U.S. Geological Survey estimates the Arctic may be home to 30 percent of the planet's undiscovered natural gas reserves and 13 percent of its undiscovered oil. A team of scientists at the USGS collaborated with international researchers to conduct the first-ever comprehensive assessment of undiscovered oil and gas reserves within the Arctic Circle. "We tried to put some boundaries on the range of possibilities and resources available in the Arctic," said geologist Donald Gautier, lead author of the survey, which is published this week in the journal Science. Using geological analysis and probability modeling, researchers mapped out sedimentary rock deposits to estimate the amount of undiscovered oil and gas beneath undersea continental shelves. This survey, the first of its kind, could help oil and gas companies locate new troves of fossil fuels. Researchers say that deep ocean basins have relatively low petroleum potential, but the Arctic is one of the world's largest remaining areas where oil and gas are accessible. Most of the reserves are projected to be in less than 500 meters of water -- roughly a third of a mile deep. Undiscovered oil in the Arctic may account for almost 4 percent of the world's remaining conventionally recoverable oil resources, USGS scientists say. "It would not mean that there would be any kind of a significant shift in global oil balance," Gautier said. "But this is especially significant for the Arctic nations." Nations whose borders lie within the Arctic Circle are Canada, Greenland/Denmark, Norway, Russia and the United States. Although it's closer to North America, Greenland is considered part of the Kingdom of Denmark. If significant quantities of oil were found off the coast of northeast Greenland, for example, that could mean the difference between Greenland becoming independent from Denmark or not, Gautier said. "Based on our study, there are 40 [billion] to 160 billion barrels of oil north of the Arctic Circle," said Gautier. The USGS had previously estimated the Arctic is home to 90 billion barrels of oil. The Energy Information Administration, a division of the Department of Energy, estimates that the world currently uses 30 billion barrels of oil a year. Offshore oil exploration in the Arctic is still in its infancy, but ExxonMobil and other oil companies already have staked their claim and started drilling in the Mackenzie Delta, the Barents Sea, the Sverdrup Basin, and offshore Alaska. "It makes sense to diversify sources of oil and gas, given that the U.S. is one of the biggest consumers of oil and gas," said Alan Jeffers, a spokesperson for ExxonMobil. "We support public policy efforts that provide greater access to these resources. We think that the energy is needed for the country's needs, and would help improve energy security and supplies," he added. But conservationists say more oil and gas extraction could have dire effects on the Arctic's fragile ecosystems, especially since many of the resources are controlled by countries and exempt from international environmental laws. Drilling for oil in some areas of the Arctic could cause toxins such as arsenic, mercury and lead to be released into ocean waters, said Lisa Speer, Director of the International Oceans Program at the Natural Resources Defense Council. "We need uniform, mandatory standards governing offshore oil and gas activity in the Arctic because activity in one country has the potential to affect the environment of the Arctic far beyond the country of origin," Speer said. The assessment also projects that the Arctic's vast natural gas reserves will strengthen Russia's status as the world's largest producer of natural gas, Gautier said. The USGS survey does not address the economic risks or technological challenges of extracting the Arctic's oil and gas. "As new data become apparent, our understanding of the resources in the Arctic can change," said Gautier.